On Sunday, October 8, 2017, Gift of Life Marrow Registry is partnering with National Hispanic Christian Leadership Conference Executive Vice President, Pastor Tony Suarez, to recruit marrow donors and give patients suffering from blood cancer a second chance at life. Pastor Suarez lost his wife Jessica in October 2016 after a valiant fight against leukemia. 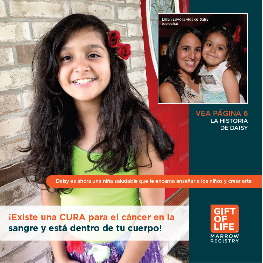 To honor her memory, during Hispanic Heritage Month Gift of Life and Pastor Suarez will work together to educate the Hispanic/Latino Community about the lifesaving potential of marrow donation, and the urgent need for more Hispanic and Latino donors to join the registry. Gift of Life Sunday will encourage people to visit www.giftoflife.org/Jessica to order a cheek swab kit and help create a future where no family suffers such a devastating loss. Everyone between the ages of 18 and 45 and in general good health is encouraged to order a free donor kit online at www.giftoflife.org/jessica and join the worldwide marrow registry. A simple swab inside your cheek is all it takes to determine if you are a match. Donor information is confidential and protected by strict medical regulations. Order your free swab kit now! It only takes two minutes to swab your cheek and return the kit in the postage paid envelope. If you’re a match for a cancer patient now or in the future, Gift of Life will call and offer you the opportunity to become someone’s lifesaving hero!